There is no stronger relationship than the one between humans and cheese. The bond that was created thousands of years ago has been beautiful and it is not about to end. Humans use cheese in a variety of ways, whether it’s grated over pasta, melted between two pieces of toasted bread, laying on top of a burger, sprinkled over a salad, or simply indulged in its delicious, naked form. Cheese makes humans happy, and because of this it is fair to say that you should never entertain without an impressive cheeseboard prepared for your beloved guests. It is as important to provide your guests with delicious cheese that will make their taste buds dance in satisfaction, as it is to have wine that will make your guests buzz in the clouds. The perfect cheese board begins with an old rhyme: “Something old, something new, something goat, and something blue.” This refers to the variety of cheeses that are recommended for a cheese board. Along with the variety, it is also important to remember to have a good contrast of textures (soft vs. hard) and flavors (mild vs. strong). “Old cheese” or “aged cheese” refers to Cheddar, Parmigiano-Reggiano, Gruyère, and Gouda. 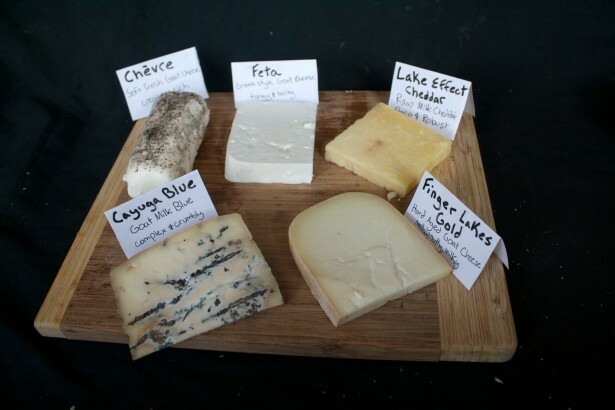 The textures of these cheeses are hard, and the flavor is usually strong. 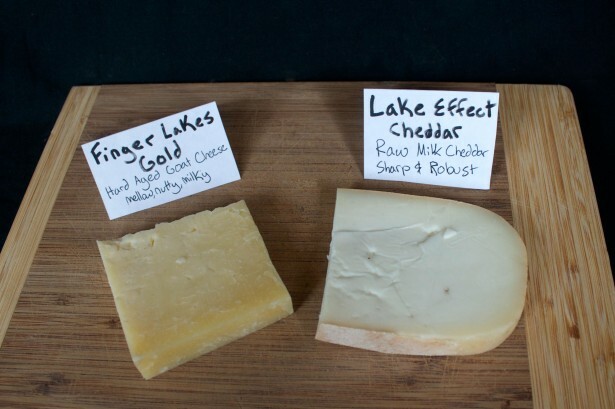 Lively Run Dairy makes two cheeses that would fall under this category: Finger Lakes Gold, which is a nutty, hard aged goat cheese, and Lake Effect Cheddar, which is a sharp cow milk cheddar. Brie also falls under the category of “old cheese,” and is usually a guest favorite because of its infamous creamy center. 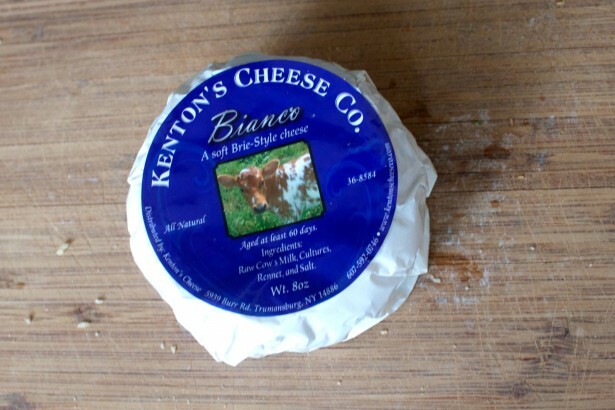 Kenton’s Cheese Co, which is located in Trumansburg, makes a delicious Brie that would complement any cheese board. “New cheeses” or “fresh cheeses” refers to mozzarella, ricotta, mascarpone, and feta. 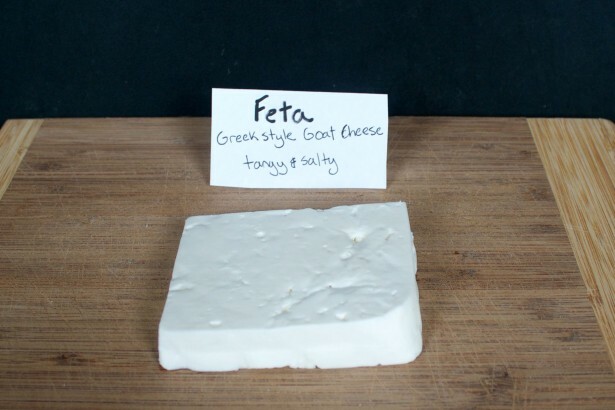 It is important to get a semi-soft or soft textured cheese to compliment the hard texture of the “old cheese.” Lively Run Dairy has salty and crumbly Balkan-style Goat Feta that would be a great fit for the “new cheese” category of a cheese board. 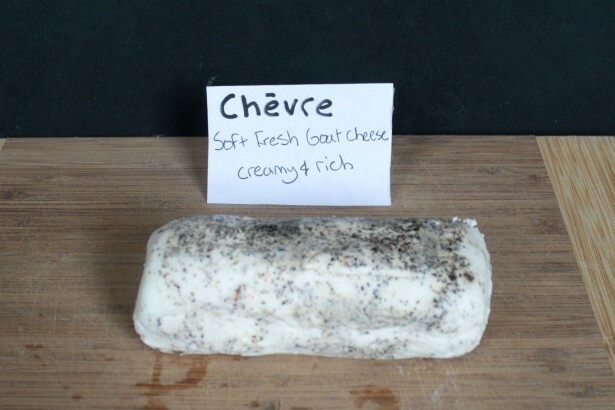 “Something goat” refers to a beloved chèvre, which is a soft, fresh cheese made from goat milk. One of Lively Run’s Herbed Chèvre logs is great to use on a cheese board because it adds flavor and color. 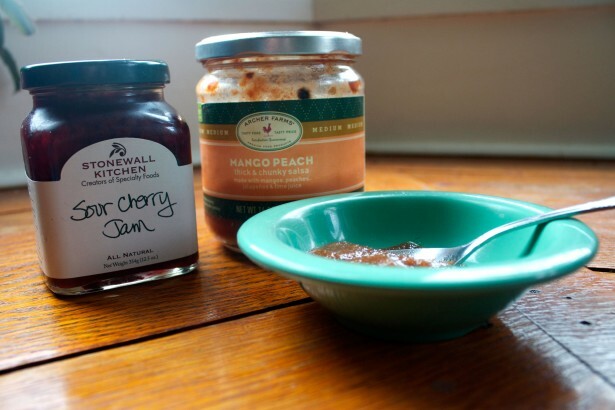 If you choose to use a plain chèvre, we recommend serving local Finger Lakes honey in a small jam bowl to complement the chèvre. “Something blue” very obviously means any blue cheese. 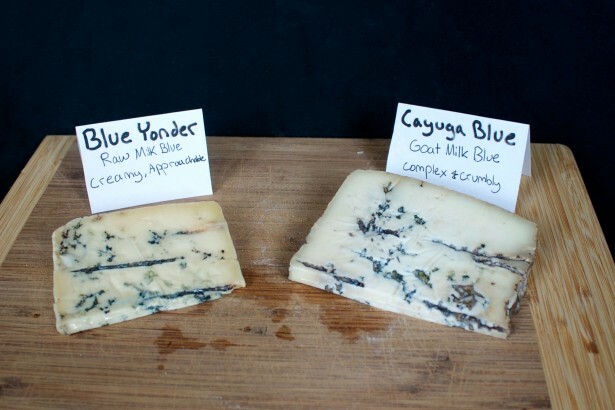 It is a good idea to taste a blue cheese before you buy it, because blue cheeses are all very unique. 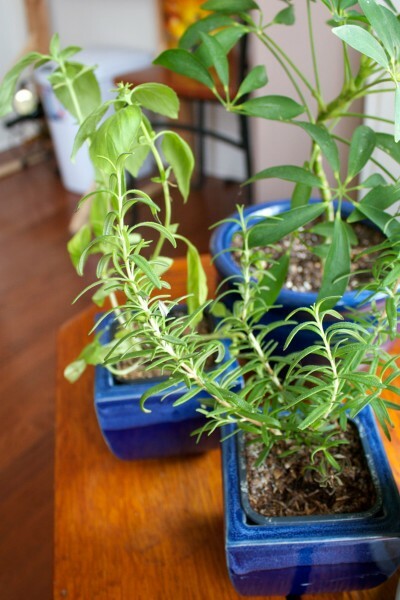 They can range from mild to strong in flavor, and soft to hard in texture. Lively Run makes a variety of delicious blue cheeses that complement any cheese board including: Cayuga Blue, which is a rich, balanced goat blue cheese, Seneca Blue Moon, which is a soft, mold ripened goat cheese with a texture similar to chèvre, and Blue Yonder, which is a creamy raw cow milk blue cheese. “Something old, something new, something goat, and something blue” is a great start for the perfect cheese board, but there are no real rules for cheese boards. Realistically, guests will love any cheese that you put in front of them. Cheese boards can also be made up of a variety of one type of cheese, such as just cheddars, be based by region, like the Finger Lakes region, or by theme, such as “autumn’s harvest” or “tropical paradise.” Be creative, buy what you love, and have fun. The recommended amount of cheese to buy is 4 oz. per adult and 2 oz. per child. Having an odd number of cheeses on a cheese board is more visually appealing than an even number. Martha’s Stewart’s guideline for accompaniments on a cheese board is “something sweet, and something crunchy.” You can get very creative with accompaniments by making them fun and colorful. It is important to have both sweet and savory options so that people can see how the variety of flavors complement different cheeses. We recommend local, fresh breads from Ithaca Bakery. A simple baguette bought the morning of your party is essential, as well as hearty whole grain artisan breads, and sweet fruit and nut studded quick breads. Ithaca Bakery also offers bagel chips that are made from their delicious leftover bagels. 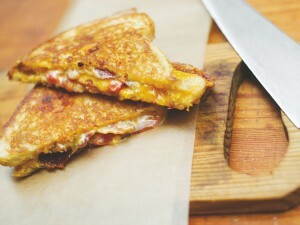 These are always very flavorful and a huge hit on the cheese board. 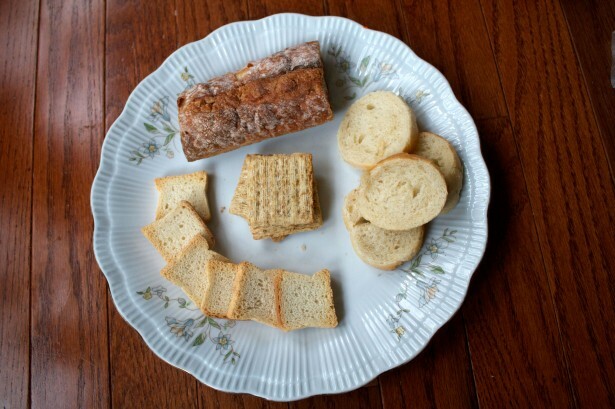 An assortment of crackers is important because of the variety of cheeses on the board. Certain crackers simply don’t pair well with certain cheeses. We recommend simple, buttery club crackers, whole-wheat crackers, crackers with seeds, and herb flavored crackers. 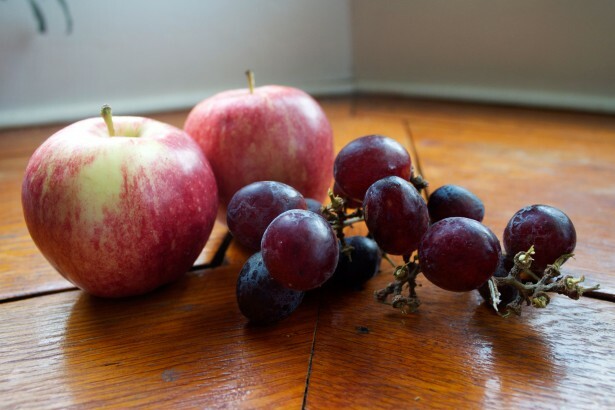 Fresh fruits, such as apples, grapes and, pears, are a classic food to pair with cheeses. All three fruits pair well with any type of cheese. Fruits are also a great way to add color to your cheese board. We recommend getting local fruits from the Ithaca Farmers Market, especially during the fall harvest. Dried fruits, such as apricots, figs, raisins, and dates. 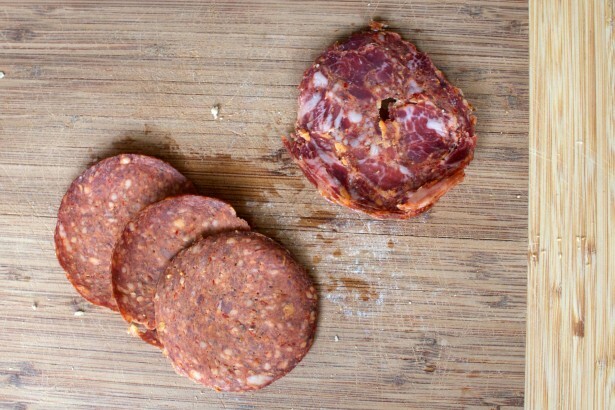 Meats, such as salami and prosciutto, are a must have on a cheese board. They add a ton of flavor and are loved almost as much as the cheeses they are served with. We recommend checking out local butcher shops such as The Piggery or Autumn’s Harvest for your meats because they are deliciously made from the labor of love. Herbs and flowers will probably not be eaten on the cheeseboard, but they are a great visual accent to make the cheeseboard look extremely appetizing. Cheeses on a cheese board should usually be arranged from mildest to strongest, clockwise or linearly, and tall cheeses should be placed on the edge so that it is easier to cut them. Each cheese should be labeled with tasting notes for the more cautious guests. Fruit and meats can sit on the cheese boards with the cheeses, or off to the side on separate plates. Fruit jams, dried fruit and nuts, and olives can be places in little ramekins next to the cheeses or off to the side of the board. Cheese boards are classically wooden boards with a handle, but a slab of stone, or just a plain cutting board also works. Slate boards are the new fashion because you can label the cheeses in chalk. Another fun thing to do is to make your own cheese board with chalkboard paint. This is a great tutorial that shows you how to make your own cheeseboard. The long knife with the forked tip is good for cutting softer cheeses, like Brie and Camembert, and it doubles as a spreader. The spade-shaped knife has a sharp edge for cutting hard cheese into slices. 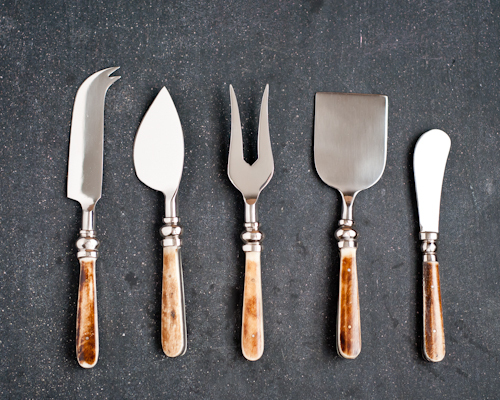 The pointed fork is good for chipping away at harder, aged cheeses like Cheddar and Parmigiano, and blue cheeses like Stilton, and transferring cheese from the board to individual plates. The flat knife that looks like a shovel is good for cutting cheese into cubes or slices, or as a spatula to transfer the cheese to a plate. The small rounded knife is a spreader for soft cheeses. Cheese should be served at room temperature, just like a nice bottle of red. Unwrap your cheese and let it breathe about 30-60 minutes before serving. We advise you to prepare and layout three quarters of what you have and then replenish when needed as guests eat. People eat what is in front of them, and if the cheeseboard is set out as an appetizer, you want them to have enough room for the main course! Cheeseboards can be served as an appetizer, first course, or even after dinner with chocolate and dessert wines. 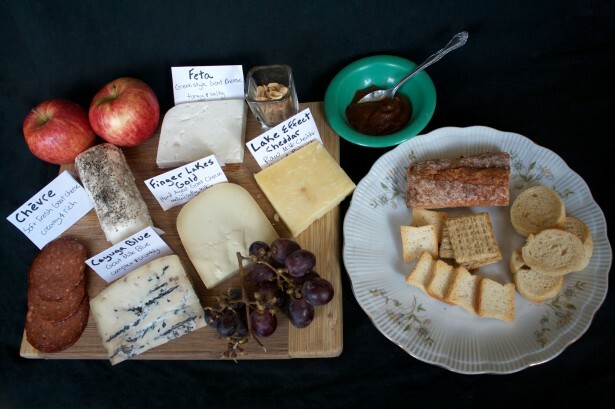 Stay tuned for our next blog about what Finger Lakes wines to pair with what Lively Run cheeses!